Now, @Arioch, you might know me as Aaron Neumann via my GMail or MisterArtMaster on DeviantArt... and I have been working on a few ideas on the side and wanted to ask you some questions, particularly on how you 'design' ships in your universe. With so many ways to design ships out there, I wanted to see how you do it so I can perfect my own. It's a good question; I'll take some time to formulate a proper answer. That's alright, I can wait. Step two: take the U.S. space shuttle and give it pointy ears. Step 3: iniate thrusters and give it a nudge sunward. I usually just shine a flashlight out the back. Step 5: add giant engine outlets. Step 6. Add a bumper sticker. This could be interesting, especially when it comes to ship's violating "the norm" for it's faction. This is very obvious for humanity's Bennet class scoutship that have smooth curvy lines unlike the other ship's in TCA's fleet. This make me suspect that it's origin is similar to Germany's Condor long-range scoutplane used during WW2 that was used to look for allied shipping for their submarine fleet to deal with. It started out as a civilian aircraft that was choose for this role for it's range capabilities. It was not meant for military use originally. Can it be that the Bennet also have civilian origins and it is designed with estetics in mind as well in a way a pure military design would not recive? The engines of the Bennet class don't look particularly curved to me. Only the fore section does. That said, from what I can see of the England class silhouette, the fore section might start with a similar curved shape as well, but it quickly turns a bit blocky and bloated as you go aft. Still, the general shape of both classes seem to share a common design to me. The England class is older. Could it be that both it and the Benett have the same origin, like the same designers? Also, TCA seem to be intent to convert their Bennets to do light security work. Perhaps there is a new scoutship on the drawing board, a new design temporarily delayed by the arrival of the Orgus and need to incorporate some design aspects from them? Access to new technology from a new ally and captured enemy technology may cause even more such delays. Actually that sounds like what happened in Babylon 5, the Earth Alliance (the humies) had two ships with RADICAL design aesthetics: the Hyperion class Heavy Cruiser and the Omega class Destroyer. The Hyperion's manufacturers made ships that look like submarines, but in space. The Omega's manufacturers -who already built and designed the Nova class Dreadnought (aka 'the most gun on a ship with the powerplant to match'... and everyone rightly feared this mofo)- were fans of the 'flying brick' look. I'd say that aesthetics are only something sci-fi writers consider. For "real" designers of (space) combat vessels, function is paramount. You don't build ships to look good, you build them to be powerful, well-armed and sufficiently protected. If the resulting design also pleases the eye, that's all good, but it's an unintentional by-product. For instance, modern "stealth" ships (I mean navy ships, here on Earth) look quite cool, but not because they were supposed to look cool, but because the methods to reduce their radar cross-sectiom accidentally result in something that also looks good. I think form given by function is often aesthetic even without any effort to design its appearance. I don't think it's accidental. Aesthetics and functionality are not entirely independent; combat vehicles look cool in part because they are functional. We have an inherent visual sense of what makes things dangerous, fast, or powerful. Modes of travel: where do battles happen? In the case of Outsider, we have moderate to large fleet actions with lots of ships. The concept of strategic action is that movement is sort of analogous to timescales in WWII naval combat, in which movement of forces from one location to another takes days or weeks. The predecessor story to Outsider had struggled with a jump drive system modeled on the one used in The Mote in God's Eye in which ships used a Newtonian model and were limited to 6 G acceleration and could only cruise for long periods at 1-2 G's; this made transits take months. For Outsider, I decided to allow artificial gravity/inertial dampers and increased baseline acceleration to 30G (I think the Lewis and Clark from Event Horizon was mentioned to have that capability, and it seemed right). Battle happens on the scales of inner solar systems. I wanted a system with a mix of weapons in which the battleship was king, missiles were a significant but secondary threat, and in which small craft were used but in a niche role. Weapons do significant damage, and ships usually can't resist more than a few direct hits. Once you have an idea what the rules of combat are, the next step is to develop tactics and doctrines for fighting. It's especially good if you can find more than one tactical doctrine that works, so that opposing sides may have some diversity in how they solve these tactical problems. Your doctrine of fighting will inform how your ships should be designed. For example, the Loroi focus on speed and offensive beam firepower, and make significant use of fighters in a defensive role. The Umiak focus on well-protected ships and powerful short-range weaponry, and use their industrial might to improve their numbers and use of expendable weaponry such as torpedoes. So Loroi ships have long sleek ships with large engines and big guns that point forward, and Umiak ships are lumpy armored chunks that bristle with short weapons that fire in all directions. Deciding the sizes and masses of ships is a question of doing some research into the scales of real and fictional vessels, and choosing for yourself where on the curve you want to sit. Examples vary widely: many sit close to real-world naval examples (like Star Trek) in which a typical cruiser is between 200-300m in length and has a similar density to a WWII ship. Some (like Star Wars have a much grander scale in which vessels can be several kilometers long. 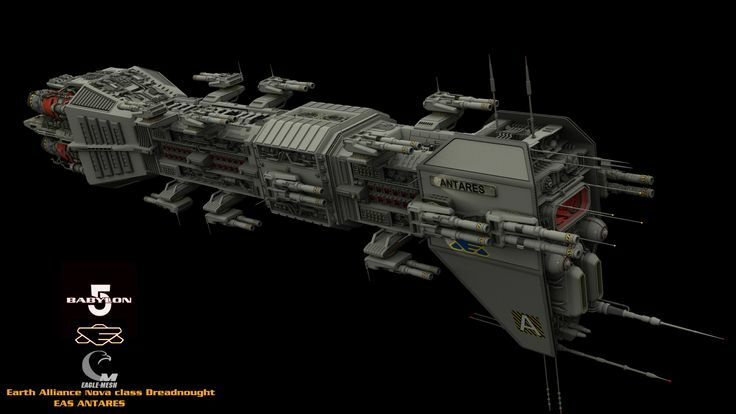 Densities are sometimes light to reflect the limitations of accelerating mass in space, and sometimes they are very heavy to indicate the serious hardware that would be needed to generate such huge amounts of power (Babylon 5, despite its relatively realistic combat rules, had very large Terran vessels with extremely high listed densities). Finally, a note on armament. I see a lot of fictional design in which the ships are simply encrusted with weaponry; but if you look at real combat vehicles, this is rarely the case. Weapons are usually the most expensive part of the ship, and they often have internal infrastructure requirements (power, heat management, ammunition storage and delivery, etc. ), and there is usually a practical limit to how many targets one ship can be expected to engage at one time. Even if your combat rules specify lumbering battlewagons with lots of small guns, there still needs to be some kind of practical restriction on how many guns a ship can mount. Even in the age of sail when ships of the line mounted 100 guns or more, they were limited by weight and arranged in gun decks that by volume only took up a small part of the ship. If you really want to get deep into how these systems interact, you can model them in game system (I used Star Fleet Battles and Starfire, and later Attack Vector) and simulate some battles to see what works and what doesn't. But that's probably overkill in most cases. So, that would be a few days in terms of crossing dozens of AU with 1 measly G if assuming constant acceleration if this is right... which is pretty slow from a space combat standpoint. EDIT: at only 5 gravities, that means going from the Sun to Jupiter will take something on the order of 5 hours. That table looks right, but I think you're off with the Sun to Jupiter estimate. Makes me wonder if the Umiak are more likely to use higher cruising velocities. On the topic of number of guns, not only are there design considerations that prevent having too many guns -the aforementioned power/heat/ammo/etc. - there are also design considerations that favor a smaller number of guns. • If armor is a major concern, a vehicle/craft as a weapons platform will generally want to have a smaller number of more powerful weapons rather than a larger number of less damaging weapons, so long as materials allow it. • If accuracy is a major concern, whether due to light speed lag or primitive fire control systems, then maintaining a low target profile is also a major concern. The system that I'm currently building puts more emphasis on volume than mass. Something like 20% of the vessel's volume is taken up on heat sinks (with hull and engine radiators being part of the hull and engines respectively) and power plants, another 20% of the volume on engines (including FTL) and fuel supplies. So there goes 2/5ths of the ship's volume right then and there. Well, the reason I've been asking about this is so I can work out what I can use for my in-universe ship builder that I've been working on... which is on it's ninth version. The primary value of a vessel is volume, with mass being planned to come into consideration during velocity calculations. The universe I've been working on is basically the size of the Inner Sphere and Periphery of Battletech fame... so ~600+ light years at the minimum (460-550 light years is the 'border' between the Inner Sphere and the Periphery). Virtually all ships within this universe utilize some sort of inertia dampening (mostly to ensure that ships can move anywhere between 5 to 10 Gs in linear movement and hundreds of Gs for various snap non-linear maneuvers), but also utilize some sort of torch or thrust drive. In addition to their normal use as defensive weapons, interceptors also generate on energy web (similar to shields) that surrounds the ship. This web reduces the ship’s defensive rating in all directions covered by the arcs of active (and undestroyed) interceptors. Thus, any ship equipped with interceptors will have two defense ratings for each direction, as shown in the example here. The first of these is in force only if there are no active interceptors that bear on the incoming fire If, on the other hand, there is at least one interceptor facing the approaching shot, the second rating (in parenthesis) is used instead. Note that the second, interceptor‐enhanced defense rating affects all weapons, even lasers. Other races utilize their own racially-specific materials or sciences to allow their armor to sustain hits, to various degrees of success. In addition to armor, genuine shields do exist. They act similarly to shields from Nexus: The Jupiter Incident and Sword of the Stars in that they prevent damage from the user... with caveats. Like shields in Nexus: The Jupiter Incident, they can resist certain weapon types more than others, like some models of shields can stop weapons with shield bypass capability from harming the equipped vessel while others simply make it harder to batter the shields down. Like shields in Sword of the Stars, they have to shut down and disperse or risk exploding. Weapons require mounts to work, and the number of mounts is severely limited to how many weapon stations that the ship has. In addition, each mount can only support so many weapons; the more weapons you want to put on a mount, the larger the mount itself. Mounts come in a variety of sizes (PD, Small, Medium, Large, Leviathan) and types (Kinetic, Energy, Seeker). Most Kinetic and Energy weapons come in turrets while virtually all the 'Seeker' (aka 'missiles and torpedoes') are either in VLS or tube-mounts. Countermeasures of the Chaff-Flare and Electromagnetic kind exist to help minimize damage. Stealth tech does exist as well, but are generally energy and heat intensive to operate. Fleet actions in a system can take months due to the fact that any planetoid or planet can be used as a base for defensive purposes, and this is on top of planetary invasions ala Ground Control. Ground combat is extensive compared to most other sci-fi, as planetary shields and anti-orbital defenses capable of resisting even the mightiest of conventional warships and weapons exist... but once those are eliminated, there isn't much you can do but disperse or be bombed from orbit.